*There is currently a high terrorism threat in Nigeria, with numerous attacks and kidnappings blamed on Boko Haram and ISHWA (allied with ISIL), particularly in the northern and middle belt states. Many governments have issued serious travel warnings for parts of the country. Travellers are advised to inform themselves on the situation and to take note of travel warnings from official government sources before visiting Nigeria. Situated in tropical West Africa, the oil-rich state of Nigeria is the most populous country in Africa. It is listed as one of the 'Next Eleven' major economies of the world - yet despite its abundant natural resources and its position as Africa's largest economy, poverty remains pervasive. Decades of civil war, famine, military dictatorships, and rampant corruption have left the country with deep divisions that will take many years to heal completely, but Nigeria shows stirring signs of recovery. The country is made up of over 500 ethnic groups and several religions, with a wide variety of languages, customs and cultures shaping a diverse nation. Abuja is the capital city, but the largest economic centre and chief port is the former colonial capital of Lagos, located on the Bight of Benin in southwestern Nigeria. 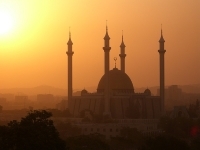 The capital was moved to Abuja, located in the heart of the country, in 1991, largely in a bid to curb the frenetic migration to Lagos not only from rural Nigeria, but from neighbouring countries as well. Despite this measure, Lagos remains a sprawling, industrial metropolis, home to over 15 million people. Although the vast majority of visitors arrive on business, the country is emerging as a prominent tourist destination in Africa, welcoming nearly two million travellers a year. With 500 miles (805km) of coastline, a vibrant arts and culture scene, and abundant natural beauty, Nigeria has all the raw ingredients to make for a top tourist destination. In an effort to unlock the country's tourism potential, the government has pledged to increase investment and improve infrastructure. Meanwhile, only the most adventurous travellers are enjoying this diverse land of sandy beaches, tropical forest, magnificent waterfalls and fascinating historic and cultural sites.